This founding father became the first chief justice of the Supreme Court (1789– 1795) and, as such, established many judicial precedents that shaped the laws of the new United States as well as the nature and function of the high court. Jay was also a great diplomat of the early republic. He was one of the commissioners who negotiated the treaty that ended the American Revolution and won American independence. 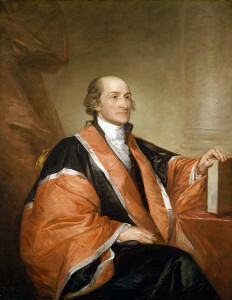 Later, in 1794, he negotiated the “Jay Treaty” with Britain, resolving lingering disputes and establishing a basis for commerce between the two nations.